Looks like this years championship could be really good. Early announcements of several new entries in the Super Car class should hopefully give the old guard something to think about. Am definitely planning to go to Croft for the first round in March especially as the ticket price has been dropped to £13! I'll have my rallycross model display with me - bigger and better than ever before. I shouod be in the Retro Rallycross area, so should see you during the course of the day. Dave Newsham of BTCC fame is the latest recruit. Hampton Caught wrote: Look forward to seeing you there!! .... and that's just the provisional entry list, Mark. I know that James Harrold will be there with his newly rebuilt Beetle, which should be awesome. The engine and gearbox have been rebuilt over the winter. When my wife and I met up with James, his wife, father Paul (who does much of the oily work and always has done on the car from when Paul's brother Peter rallycrossed the same Beetle in the 70s, 80s and 90s, and Paul's wife at the 'Night of Champions', the rallycross prizegiving, they were pessimistic about being at Croft. When the car was built in the 1970s, they used many parts off the shelf which were easy to source. These parts have become scarce over the passing decades (gulp!) and consequently soemhave been difficult to source. So, it looks like they've got the pieces and rebuilt the car, which is great news!! Shirley Gibson has confirmed to me today that the Retro Rallycross base will be in the hospitality room alongside the pit garages. I'd suggest that Forum members give me a call when you're about and I'll get you in to see the display close up. PM me with your mobile number before Saturday night and I'll get back to you with my mobile number. The entry list is looking very good. 12-14 Supercar-drivers, loads if Swifts, a good turn out of Retro and even 5 Junior Swifts. Supernational looks a bit light, but there are always late entries! Superb rallycross display, Steve - as always! - and many thanks for the photo, Mark! Love the Martin Schanche / Rob Gibson / Tommy Kristoffersson 'mêlée' diorama from 1991 ERC at Mondello Park mate - very nicely executed. 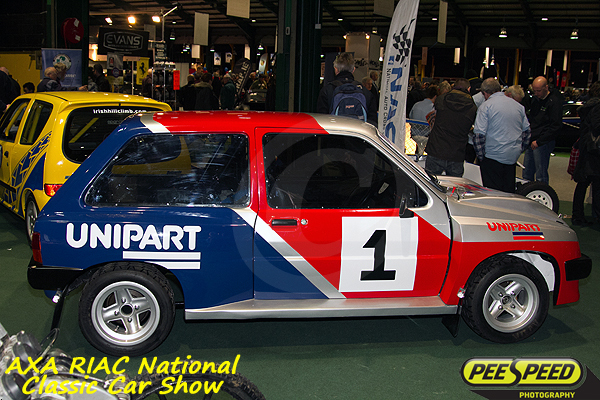 Steve had some of the others on display at Race Retro, including his Steve Palmer 'tribute turntable'. Cracking display Steve. Credit to you. Thanks for putting pic's up Mark.